"ASCP has been a partner beside us from the very beginning of PEPFAR. ASCP volunteers and staff have assisted PEPFAR improving global health by working with resource limited countries to enhance laboratory quality." The ASCP Center for Global Health is a dynamic team focused on improving laboratory practice by identifying challenges, exploring innovative approaches and forming partnerships to implement sustainable solutions. The goal of the Center for Global Health is to raise the profile of the laboratory workforce around the world. With our partners in government agencies, non-governmental international organizations, academia and the private sector, we provide cost-effective and sustainable solutions that empower laboratorians and improve laboratory quality and patient care. ASCP uniquely tailors its activities to each country’s needs. Consultants and staff conduct laboratory site-visits and participate in stakeholder discussions regarding the needs, gaps and strengths within the national laboratory system. Based on these discussions, ASCP creates a tailored assistance program to strengthen laboratory capacity. ASCP also provides template versions of all training materials that may be modified to create country-specific training packages. In addition to systems and personnel, ASCP is also a leader in assessing laboratory quality. Since the launch of the Strengthening Laboratory Management Towards Accreditation (SLMTA) program in 2009, laboratory accreditation has been a primary focus of CDC and PEPFAR, indicating that a laboratory meets the international standards for quality management. ASCP conducts laboratory assessments and provides training to national auditor teams so that countries can take ownership of their national programs and delivery the quality laboratory services their patients need. ASCP conducts training in laboratory management, quality management systems (QMS), HIV rapid testing, clinical chemistry, hematology, CD4, HIV viral load and phlebotomy, which support the improvement of diagnosis and laboratory monitoring of people living with HIV/AIDS. ASCP’s training programs can be combined with a “training of trainers” (TOT) workshop to empower participants to coordinate and facilitate further rollout of trainings through the existing tiered laboratory network. In partnership with CDC, ASCP was a founding partner in the SLMTA program. This series of trainings, with intervening sequences of structured mentorship visits, focuses on improving laboratory quality management to assist laboratories as they pursue international accreditation. This process is unique in that it is a step-wise approach, using a WHO-AFRO checklist called Stepwise Laboratory Quality Improvement Process Towards Accreditation (SLIPTA) to monitor laboratory progress and recognize advancement (from 1 to 5 stars) as laboratories improve their QMS. SLMTA standardizes the principles of accountability, transparency, empowerment, advocacy, and sustainability, facilitating the global effort to improve laboratories. Once a laboratory has achieved 5 SLIPTA stars, they are nearly ready to pursue ISO 15189 international accreditation. As more laboratories have reached this level, ASCP can develop specific training programs to address remaining gaps, providing the final push towards international accreditation. In addition to in-service trainings, ASCP provides specialized consultation on pre-service education. Working with in-country academic partners, ASCP staff and volunteers have led the process of revising medical laboratory curricula in nine countries and contributed to stronger certificate and diploma programs. When requested, ASCP teaching methodology workshops and faculty mentorship will build educator confidence and skill as they roll-out of the updated curricula. By bringing academic instruction in laboratory medicine to modern standards, ASCP is building knowledge and helping countries develop the next generation of laboratory leaders. Since its inception, ASCP’s Center for Global Health has worked around the world to improve laboratory quality and build a skilled laboratory workforce. In collaboration with the U.S. Centers for Disease Control and Prevention (CDC) and local governmental, nongovernmental and international partners, ASCP has assisted 29 countries to improve the diagnosis, care and treatment of people living with HIV/AIDS. These activities have comprised hands-on technical trainings as well as consultation in the revision of university curricula, faculty training, quality systems consultation and mentorship, strategic planning, policy development and laboratory accreditation. In ten years, 6,488 laboratory professionals have been directly impacted by over 233 of ASCP’s training events. Technical assistance has impacted the areas of strategic planning, accreditation, quality systems, and management. In addition, ASCP has played an integral role in developing several countries’ laboratory strategic plans and has assisted in curriculum development at medical technology schools in Cambodia, Cote d’Ivoire, Ethiopia, Lesotho, Kenya, Mozambique, Nigeria, Rwanda, Sierra Leone, Swaziland, Tanzania and Vietnam. ASCP continues to seek new ways to contribute, expanding its scope of work through participation and leadership in such activities as international policy meetings. "The role of laboratories is becoming increasingly important in view of the expansion of programs on prevention of mother-to-child transmission, voluntary testing and counseling, and access to antiretroviral therapy." An ASCP-led coalition that will provide rapid cancer diagnostics, care and treatment to underserved areas in Sub-Saharan African. To find out more about what ASCP is doing and how you can get involved, please visit our Partners for Cancer Diagnosis and Treatment in Africa web pages. In October 2015, our first site was selected in Rwanda at the Butaro District Hospital. In March of 2016, histopathology services, telepathology connectivity, whole slide scanners were delivered to the site, and, in April, ASCP volunteers and local technical staff in Rwanda were trained. Since then, all cases processed in the laboratory have been scanned and read digitally by the local pathologist at the site in Butaro with consultation by a team of ASCP volunteers on ~10% of cases. So far, over 600 ASCP members have volunteered to support Partners for Cancer Diagnosis and Treatment in Africa. Deployment of telepathology systems or connectivity to volunteer teams are currently planned for sites in Tanzania, Malawi, Uganda, Haiti, Kenya, Liberia, the Democratic Republic of the Congo, Ghana, and Kigali, Rwanda. ASCP strives to support quality patient care through rapid, accurate, high quality test results for every test, every time, anywhere in the world. The ASCP Center for Global Health (CGH) is focused on finding solutions to pathology and laboratory medicine challenges around the world. In this spirit of creativity, ASCP CGH is hosting the ASCP Global Health Ideation Challenge 2018. Through this ideation challenge, ASCP members, pathologists, laboratory professionals, students, patients or the general public have the opportunity submit problems, challenges, or questions and solutions to potentially win a cash prize! The focus of the 2018 challenge is solving global health challenges through leapfrogging, or using new technologies or approaches to circumvent traditional approaches and avoid incremental steps. Check out this infographic to learn more about leapfrogging. The ASCP Global Health Ideation Challenge 2018 is comprised of two rounds. 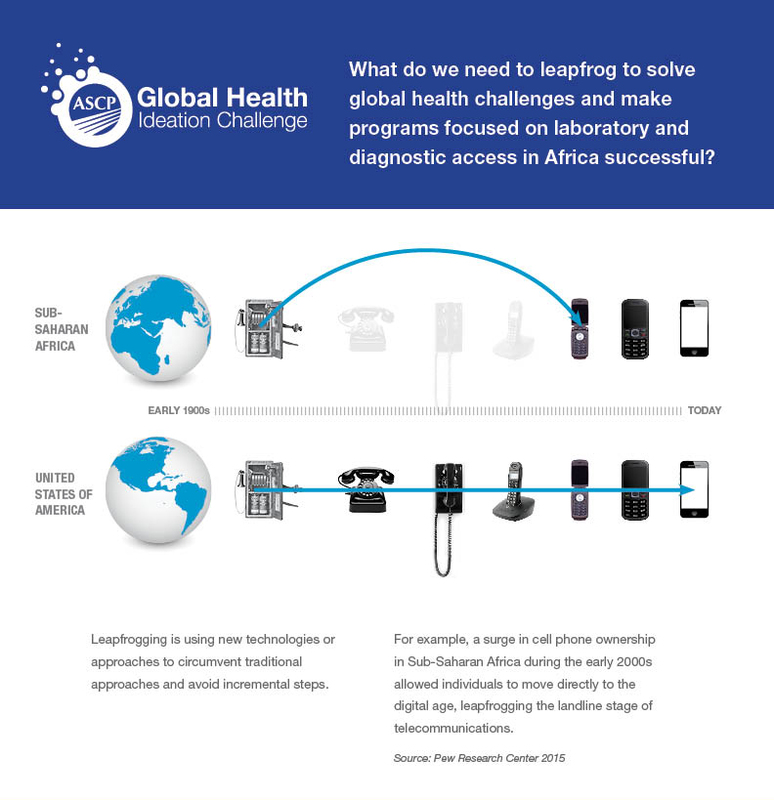 In Round 1, participants are asked to submit problems, challenges, or questions they think need to be addressed using leapfrogging to make ASCP’s Partners for Cancer Diagnosis and Treatment in Africa initiative or similar programs focused on laboratory and diagnostic access in Africa successful. In Round 2 of the Ideation Challenge, participants are asked to submit a solution to one or more of the selected questions. Participants submit global health problems, challenges, or questions which need to be addressed in 250 words or less. The first 500 participants will receive a prize for submission, limited to one prize per participant, while supplies last! Watch for updates on the challenge via ASCP’s Twitter, Facebook, and Instagram (#ASCPIdeas) to find out more about participant prizes. Entrants whose problems, challenges, or questions are selected will be awarded an initial prize of up to $100. Participants offer solutions to selected problems, challenges, or questions from Round 1 in 1000 words or less. Entrants whose solutions are selected will win up to $5,000. Prize amounts are variable based on significance, impact, innovation, and thoughtfulness of ideas. Official rules and regulations for the challenge can be found here. Congratulations to the ASCP Global Health Ideation Challenge 2018 Round 2 winners who submitted the top 6 solutions! From the global health problems, challenges, or questions submitted during Round 1, three questions were developed. Check out the questions and the top 6 solutions below. Question 1: We are seeking low cost and simple innovations that address the critical needs in breast cancer to move patients from diagnosis to treatment in the shortest possible time. Breast cancer is common and often presents late in low-resourced settings, especially those without clinical screening. Therefore, rapid transition from clinical recognition to initiation of chemotherapy is critical for improving outcomes. We are seeking low cost, simple innovations, solutions and/or systems which address the critical needs in breast cancer to move patients from clinical recognition to treatment in the shortest possible time. Emphasis should be on solutions with highest impact in low-resource settings. Question 2: We are seeking cost saving innovations that will move away from requiring standard tissue processing in the immunophenotyping laboratory so that “FNA directly to treatment” is possible across a range of malignancies. Routine histology including tissue processing is the most common pre-step to immunohistochemistry in diagnostic pathology. However, fine needle aspiration (FNA) can provide rapid morphological assessment of tumors with little equipment. The barrier to FNA being superior is a method to use FNA samples directly for immunohistochemistry (or similar marker detection) for diagnosis confirmation and treatment selection. Question 3: We are seeking novel mobile digital applications that improve patient care specifically focused on the diagnostic process for malignancy with an emphasis on impacting patients in low-resources settings. Mobile digital applications are rapidly improving patient care around the world through a variety of tools, tips, and registries. We are seeking novel mobile digital applications that improve patient care specifically focused on any aspect of the diagnostic process for malignancy with an emphasis on impacting patients in low-resources settings. Free pathology specific medical records app for smart phones that streamlines work flow and leap-frogs the traditional costly desktop-based model. Training and implementation of Rapid On Site Evaluation of Fine Needle Aspirates for improved diagnostic accuracy and turnaround time. Workflow processes which incorporate FNA along with frozen sections and IHC to reduce cost, time, and improve accuracy. Rapid evaluation of FNA samples from breast cancer using point of care molecular devices. Mobile "store and forward" clinical image application for breast cancer to speed referral process to decrease treatment delays. Establishment of multidisciplinary breast clinics for faster evaluation and treatment planning for patients. Thank you to all Round 1 and 2 participants for taking part in the challenge! Check out the latest news and updates from ASCP's Center for Global Health on our ASCP News webpages!